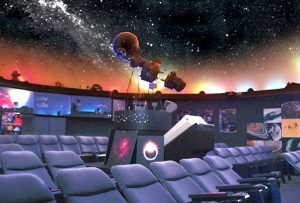 The planetarium’s sky theater consists of a hemispherical dome ceiling and a Spitz SciDome HD digital planetarium projection system. A set of complex computers generates a highly detailed picture of the heavens. Images appear to move across the sky in a way that accurately reproduces the natural changes that occur in the sky. The daily and annual motions of the Earth, as well as the latitudinal change of the observer are controlled by the projectors, thus allowing the planetarium to act as a “time machine” capable of taking the viewer to see celestial events of the past or the future. In addition, a number of auxiliary special effects projectors are available to demonstrate such phenomena as auroras, comets, lightning, and the solar system as viewed from space. Special panoramas can also be projected to add additional realism to the programs. The planetarium’s multi-channel audio system envelops the audience in state of the art sound. Classical symphonic and popular music are used to enhance the planetarium experience.